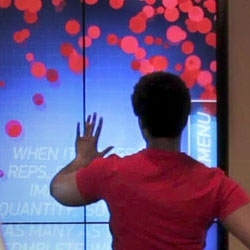 A seven-foot motion-activated interactive wall developed for Bally Total Fitness. Integrates Adobe Flash and Microsoft Kinect using the SoftKinetic IISU SDK. More about the project from Visual Advance.